Taking Frost’s acerbic poem a bit too literally, the Monday before Christmas (the northern hemisphere equivalent of the end of June) a killing frost destroyed my third try at cucumber and zucchini seedlings, and damaged my precious tomato plants. What seemed like a tragedy at the time, though, paled to insignificance beside a major grass fire on the 9th of January. Burning about 150 acres of paddock and native tree plantings, it cut a fast, hot swath across the northern part of the farm. The fire started on the highway, and you can see how close it came to the house, kennels and woolshed. By tremendous luck, no people, animals or structures were harmed. In fact, I nearly titled this Yarn “It’s Better to Be Lucky than Good”, but I couldn’t resist using my favourite Robert Frost poem instead. As it happened, this is the first major grass fire I’ve had on the place, and I wasn’t even here to be a part of it. I had made a lightning trip back to the US to help my cousin Pam move my mom from Idaho to Colorado, to a much better assisted living facility right near Pam. The night we flew into Denver was the day of the fire, so my poor house-sitters, Ani and her partner Narayan, were left to cope with the trauma. The starting point of the burn on the other side of the main highway. 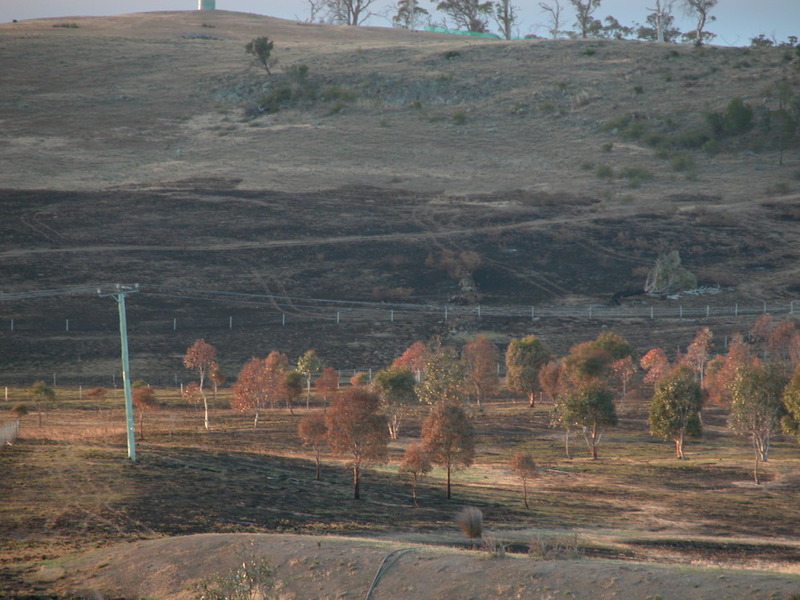 The burn moved from right to left across the photo. Happily, they had lots of help—4 fire trucks, a water helicopter (huge, I’m told), 2 water planes and numerous small fire fighting units brought by neighbours. One of my good friends, Andrew Fish, was on the scene within minutes of smoke being sighted, and helped Ani and Narayan figure out what to do, making sure the dogs and cats could be readily evacuated if necessary. It wasn’t necessary, in the end, but not by much: the fire was stopped within about 50m of the dog kennels, and 100 m of the house. Looking down at the burn from the top of the hill. 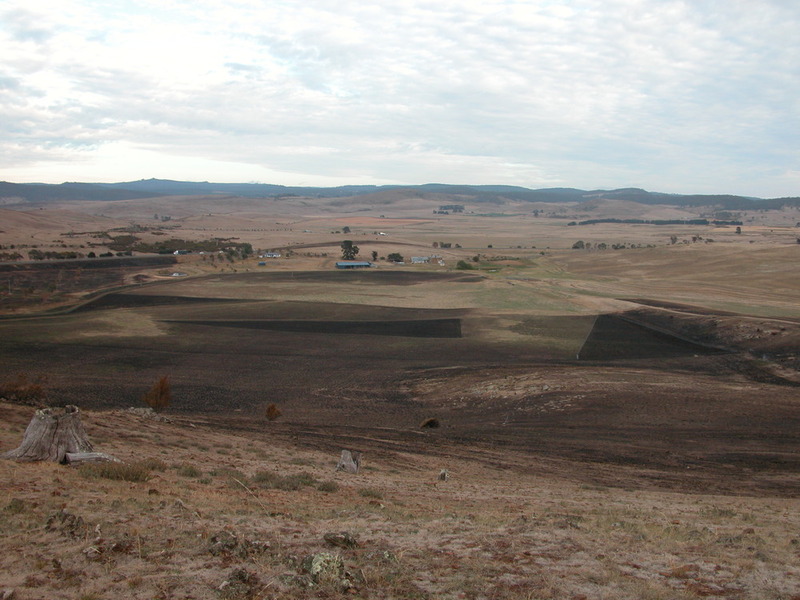 The three dark triangles are fenced-off revegetation sites, where about 500 young trees were planted nearly 3 years ago. Because the areas weren’t grazed, the grass was quite dense and long, and the burn was correspondingly hot and thorough. It will be months before I know if the little trees can regenerate from their roots, or whether I’ll be replanting. And fire wasn’t the only thing Ani and Narayan had to cope with while I was gone. A full-grown female copperhead snake resides under my house. Several times over the years, her 1-year-old offspring have found their way up through the hole in the kitchen floor where the gas pipes run to the stove. The baby snakes are only about 6 inches long at that stage, and don’t constitute a hazard to anyone—people or cats—in the house. But they are a bit disconcerting to find in the kitchen. I stopped up the hole with bits of aluminium foil a couple of years ago, and haven’t seen any baby snakes since. I honestly forgot about them altogether, and the list of things for Ani to worry about certainly didn’t include house snakes. You might well ask why I habour a copperhead under my house. Setting aside the difficulty of catching a snake under a house with an 18 inch crawl space, Australian copperheads, though venomous, have such small heads and mouths they can’t get a bite on anything much larger than a tiny frog. There has never been a human death reported from a copperhead bite in Australia. The main advantage of live and let live with copperheads, though, is they eat baby tiger snakes. Tiger snakes are both venomous and quite able (and occasionally quite determined) to bite humans or cats or dogs. If you have copperheads, you won't have tiger snakes. The flock grazing this morning. The landscape in the background is typical of the southern Midlands at this point–grazed to the ground. Ironically, the main reason the fire took hold so fiercely is because I’ve been conserving forage, so I actually had grass to burn. Sigh. 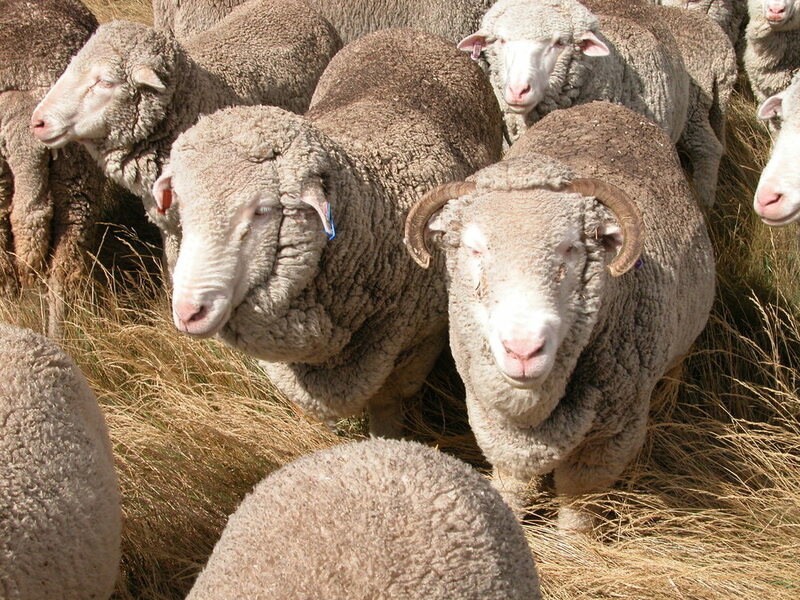 At the writing of the last Yarn (Flies and Spiders), I had decided to sell about 2/3 of the flock, due to lack of sufficient forage to maintain healthy sheep. Just before Christmas (starting on the day of the frost, in fact) my friend and expert stockwoman Karen Fish and I spent 3 days going through the entire 1000 sheep, deciding which to keep and which to sell. We marked 400 to keep, 600 to sell. I kept most of the 2-year-olds, the youngest year class I have, and a selection of older sheep to try to hold on to the wisdom of the matriarchs as best I can. Alice, on the right, with Old Leader, in 2014, at age 10. 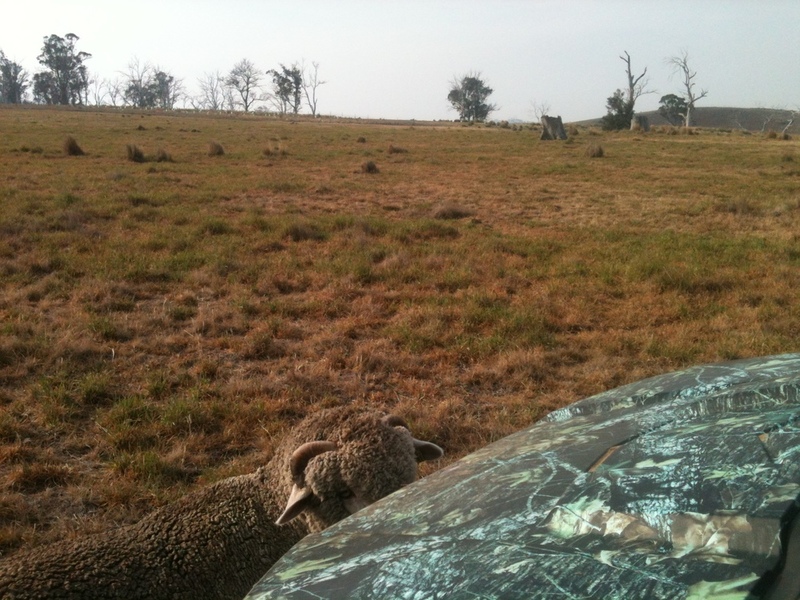 In 2008, in a time of similarly challenging rainfall deficit, I sold 2/3 of the flock. I had tried to find Alice in the sorting process, but she always kept her head down when she was in the yards—I think she was scared I might put her back in that sling. Anyway, I didn’t find her while we were sorting. The next day, as the 600 sale sheep were waiting for the overdue truck driver, I walked past the yards, feeling quite sad. Even though it made me cry, I turned to the flock, and said, out loud, “Thank you girls, for all you’ve done for me.” And Alice walked to the front of the flock, for all the world as if to say “For goodness sake, get me out of here!” Which I did. Needless to say Alice, now 12, made the cut again this time, along with all the other named sheep. Alice’s “walker”–a lightweight frame that helped her to stand and keep her balance until she was well enough to do so on her own. Each morning I would get her up and into the frame, then drag the frame along to fresh forage as she grazed. She ate the diverse plants in a particular order, each time I moved her: chicory, plantain, lucerne, clover, and when they were exhausted she would look up a me to get me to move her. 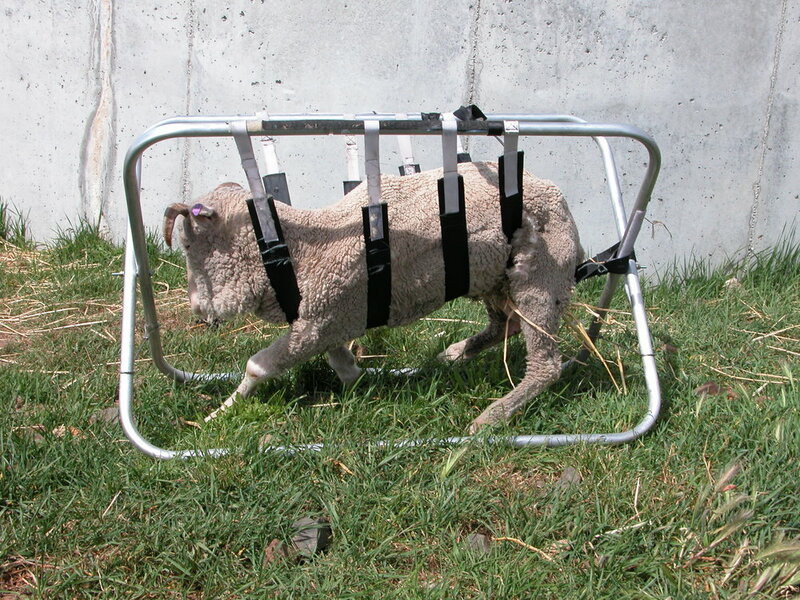 She was selecting the forage she needed to balance her diet and repair the damage of a bad lambing. After about 3 months, she was able to rejoin the flock. Another half an inch of rain since the fire has the burned area looking surprisingly green, especially if you look across it at ground level. The lucerne and grass are making a fast comeback. I won’t know for a while whether my 500 or so 3-year-old native trees and shrubs scorched by the fire will coppice from their roots. However, the burned native grassland section--the face of the big hill--will be a wonderful story to watch unfold as the landscape recovers with time and rain. 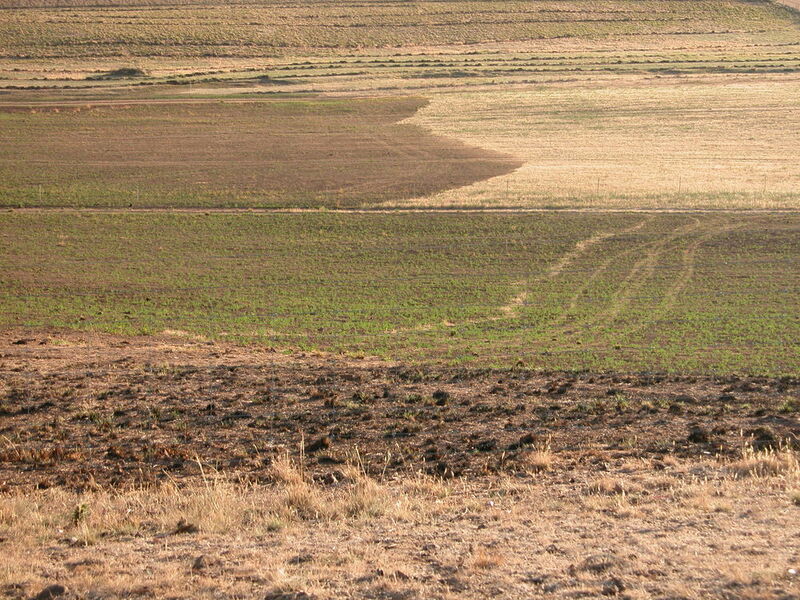 The lucerne paddock two weeks (and half an inch of rain) after the fire. The plants have regenerated about 3 inches of new growth. A similar shot after 2 weeks. Just for giggles–this is Leo, one of Vicky’s many boyfriends, checking out the Polaris Ranger. Leo LOVES the buggy, especially the tires. He looks at it most intently, as though he’s trying to figure out how it works. Hence his name–after Leonardo da Vinci.